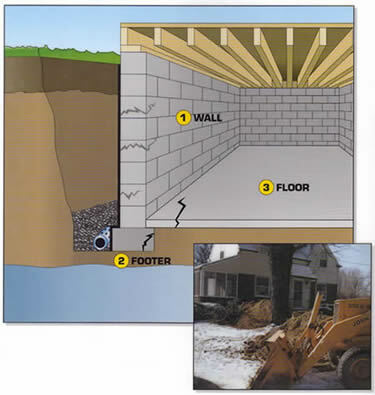 Option 1 – Total Excavation: In this method, we use a backhoe to dig around the outside of the home’s foundation all the way down to the footing. After the wall is completely exposed, the original footer tiles are checked and, if needed, replaced. The wall is then sealed with waterproofing materials, such as tar and plastic. Gravel is poured over the pipe and the dirt is replaced in the hole. 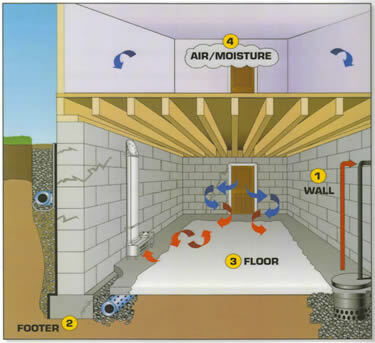 Option 2 – Interior Systems: Inside drains may be used to waterproof from the inside of the basement. 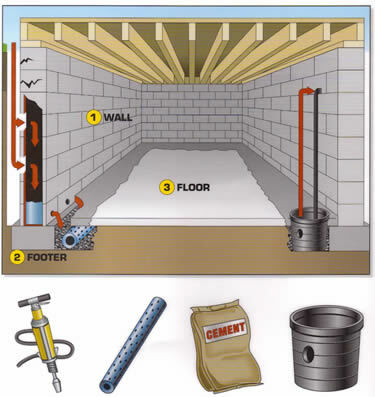 Typically, this involves opening the floor around the perimeter of the basement, digging a trench, and installing pipe and gravel around the footer. We also install ‘weep-holes’—small, one-half- to three-quarter-inch holes in each block cavity—to release any water that may be trapped. The holes are covered with a plastic molding or styrene panel before the floor is re-concreted.